Initial efforts to de-artifact the bands 1,2, and 3 images. 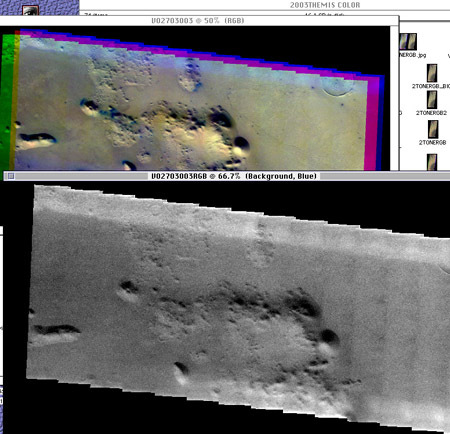 Color images of many strips of Mars have been obtained by the Mars Odyssey spacecraft. Overlapping images are captured in numerous wavelengths including those within the visual range indicated on the spectrum diagram (left). Initial releases of the spectacular Mars Odyssey THEMIS images require further work to remove obvious instrumental effects of repetitive nature. The 'framelet' brightness differences seen in varying degrees on many THEMIS images seem likely to benefit from further processing steps. Manually retouching may be the best method of removing obvious light scattering effects seen generally along the edges of many frames. While attempting to manually remove these effects checking between the original and the work in progress is constantly done, with the idea consistently in mind of 'trying to show what the camera system is trying to tell us'. It is better to work on each gray scale color band separately, removing all obvious traces of the 'banding' and partial overexposure. The result of this effort can then be viewed in color, using the 'dodge' or 'burn' tools again on each color channel to carefully fine tune the overall color balance of similar 'light struck' terrain to match that of the more pristine portions. The image at right shows a screen shot of work in progress on a THEMIS violet channel image. First the 'framelet' borders are carefully adjusted to match the values with the least excess of blue in the RGB images. This has been done on the left portion of the image. Next the light leak along the edge of the image strip is carefully 'burned' to erase the tonal discontinuity along that axis.The lower left corner showing the effects of that stage of artifact removal. The possibility of leaving many more subtle artifacts in the wake of such work is difficult to eliminate, however I believe the results are a clear improvement in the resemblance between the images and the original subject. In examples below both original and retouched views are provided for comparison. The process of initial artifact removal is aimed toward displaying the original color balance. The further step of trying to approach 'natural color balance' starts with the best presentation of the existing color data. The actual RGB colors of Mars are known from recent careful color measurements from Earth based telescopes, the Hubble Space Telescope, and measurements by several orbiters. the six successful Mars landers to date have provided detailed color information from their locations. Efforts to shift the color to a 'natural' visual impressions requires reference to the above resources. In my 'editorially color balanced' adjustments I have been rather conservative in how much I move the colors from the original. An apparent exaggeration of blue colors in the darkest areas of many pictures is a major consistent issue I note in the initial color releases. Some of this may be due to thin hazy clouds. The least dusty dark rock and dune regions approach being dark neutral gray and when color balancing can actually be useful as gray references in some cases. One of my first attempts at 'cleaning up' a THEMIS color image, ( V02401006) presented in its 'raw' form on the left and the results of my effort to remove instrumental artifacts on the right. 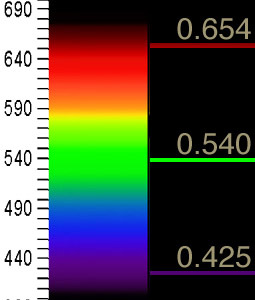 The general color balance within about the central 70 percent of the raw images was assumed to contain the best color information. The bright artifacts in band 1 generally required the most work, the high fidelity bands 2 and 3 generally being close to flawless. Here is another similatr example, (VO2703003) showing the 'clearing of the window' effect I am striving for. A look at the RGB bands in an image processing software will show especially clearly the artifact removal. The edge light leaks in the blue channel are more severe in this case. The saturated dark spots are probably not this color, as regional thin cloud layers, better seen in the shorter spectral bands, show up first over the darkest portions being surveyed. Note: Since this was a written in 2008 the color releases from THEMIS have benefited from modeling of the light leak factors being incorporated into the initial processing.